i'm actually wearing jeans...! i don't know why i don't wear them more often, because they're mega comfortable and versatile. i managed to snag myself this lovely pink pair from topshop, i think they're the really popular pair that always sell out? i can see why, what a great colour! they'll go with so much, including these sort-of loafers that i bought ages ago but never found the perfect thing to match them with... search over! I love love your jeans what an incredible colour i love the powder pink look. I wish i had a pair that colour, might have to do some saving up. I love this outfit! Those jeans are great and your hat really suits you. Lovely outfit. 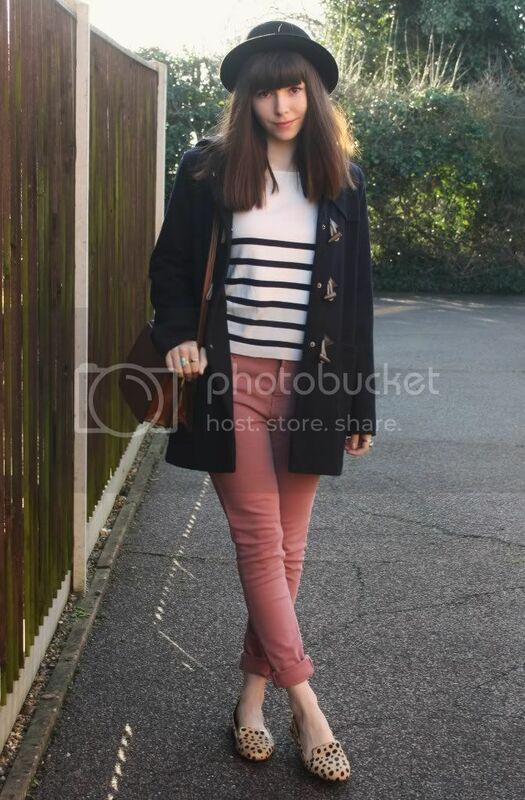 I struggle to out together decent outfits for jeans, but maybe colourful ones are the solution after all! Oooh, pretty colour of those jeans! I'm the same in terms of not wearing jeans often (oh, the irony that I'm wearing them right now) - I actually don't find them that comfy and prefer to wear skirts and tights. Love the colour of those jeans!! I'm a sucker for a great peacoat. But to add the stripes and leopard print? Absolutely perfect! Love this uber cute casual chic look! 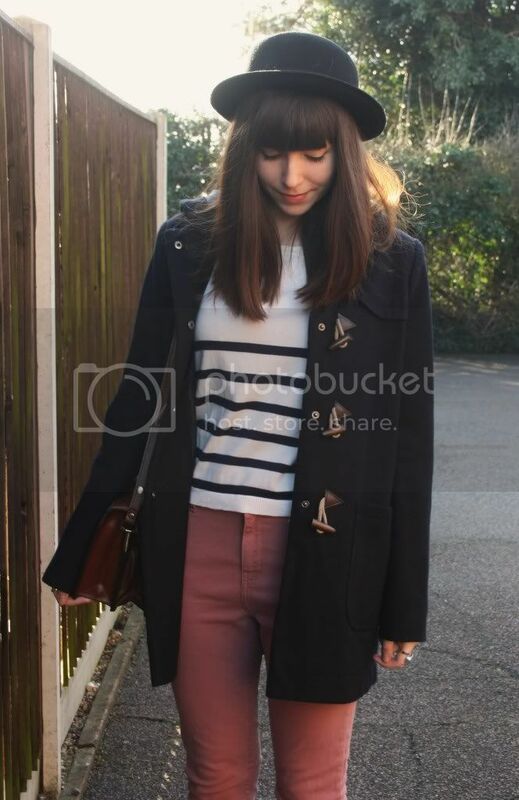 Lovely striped jumper with the duffle coat. Those jeans look lovely on you. i love your shoes and trousers! love the print mix and sweet pants! 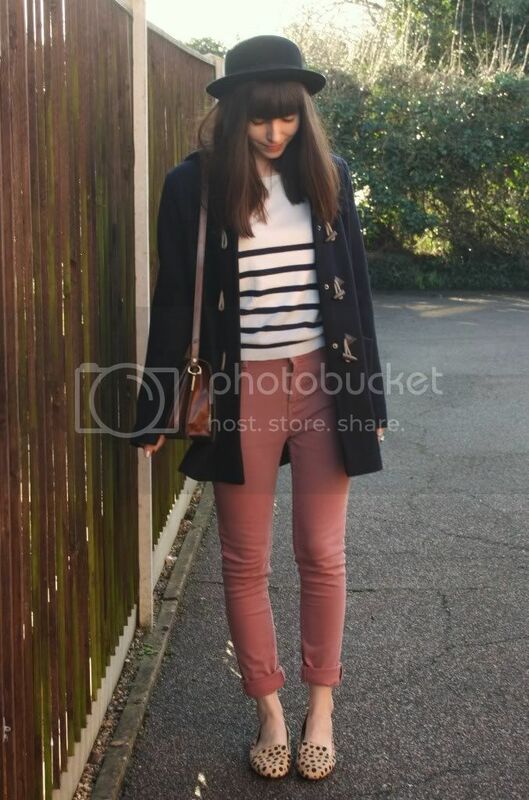 Those rose-colored jeans are fantastic! I really love how nice they look with the leopard print shoes. I wish I had as many cool pairs of jeans and trousers as you do! I love that toggle style jacket! I love the pink pants!! You pulled them off extremely well. They look lovely. I love love love the blush shade of your jeans! <3 So gorgeous! love your outfit! and your shoes are so beautiful! love this ! and you're hair looks absolutely amazing ! Love your style! 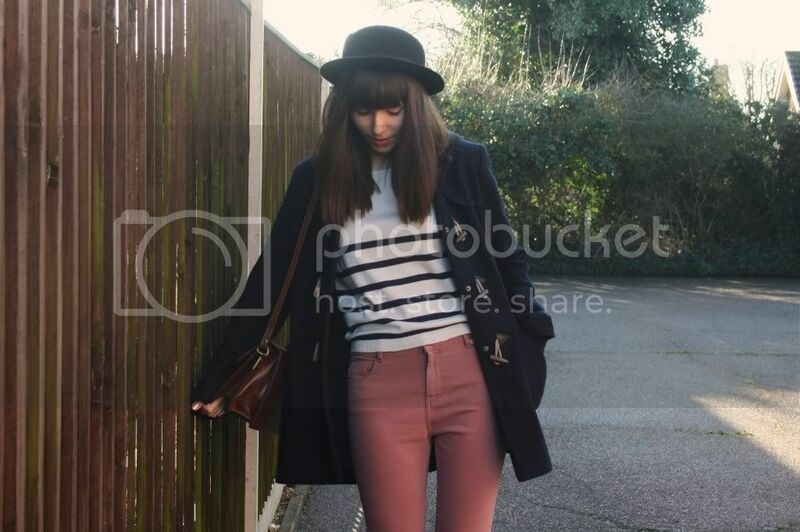 Great outfits, very nice blog! Found your blog from Chictopia and now am enjoying reading your blog. and I love love love your outfits in this post. Now I'm dying to get that jacket. Nice to know you.